Peel the squash and dice it into 1/2 inch cubes or even smaller. If using Delicata, remove the seeds with a long spoon, then slice into rounds. Melt butter in a wide skillet and add the rosemary. Cook over medium heat to flavor the butter. After 3 minutes, add the squash and cider plus enough water to cover. Bring to a boil, add 1/2 tsp salt, and simmer until squash is tender, 20 to 25 minutes, by which time the juice will have reduced enough to provide a glaze for the squash. If not, raise the heat to reduce it quickly. Sprinkle on a tsp of vinegar and taste for salt. Add more vinegar if you need to balance the sweetness, then season with pepper. In largest lidded skillet saute onion in olive oil and butter, 2 minutes, or until they are clear. Add chopped zucchini, diced tomatoes, and garlic to onion and stir on high for 2 minutes. Add 1/2 of the oregano, stir. Cover and simmer on lowest setting for 10 minutes, stirring every 2 minutes. Ready when zucchini is soft and slightly clear in the middle. Pour into a large serving dish, sprinkle w/ salt and pepper, last 1/2 of oregano and parmesan. In a small bowl, combine peaches, onion, tequila or rum, lime juice, cilantro, peppers, lime and cumin; mix well. Refrigerate several hours or overnight to allow flavors to blend. Wash sweet potatoes and place in microwave. Cook on high 3 minutes. Turn and cook on high for 8 more minutes, if large cook longer. — OR — Bake in oven 40 minutes. — OR — Grill: Rub outside of skins with butter or vegetable oil. Grill over medium hot coals until fork tender, about 8-10 minutes, turning frequently so skins won’t burn. Make an incision into middle of potato, generously spoon Peach Cilantro Salsa into center. Spaghetti Squash is easy to fix. You can have an Italian dinner in an hour. Grab a stick of French bread the next time you are shopping or if you have time to bake your own, all the better. Begin by roasting your unpeeled squash in the oven. Rub hands with olive oil and then rub squash skin, place on a foil covered sheet, until it is lightly browned and the kitchen is fragrant about 40-50 minutes – xl sizes can take an hour). While it is cooking you can prepare the rest of the meal. Slice your bread and then reassemble the slices back into the loaf shape, wrap the loaf shape in foil and leave the top seam open an inch down the length of the loaf. Chop all your vegetables. The size you chop your vegetables depends on your taste. If you like to taste each flavor then leave them in large chunks, but if you have small children (especially those who like to pick individual veggies out, then chop them all fine and they will all blend together into the sauce). Now you are ready to assemble. Sauté onions, peppers, and zucchini in a hot skillet on the stove top with a little garlic and olive oil. When the onions turn clear, add a handful of cored and diced tomatoes (again, choose the size you like). Cook it for another ten minutes stirring often until the tomatoes lose their shape. Turn it off and cover and let sit. If you are hiding the veggies, now is a good time to add an optional jar of your favorite spaghetti sauce. Remove the spaghetti squash from the oven when cooked (it will dent nicely with the handle of a wooden spoon.). Put previously prepared bread wrapped in foil into oven. Place squash onto a platter. Let it sit for a few minutes. Slice down the center and discard the seeds and “goo”. Scrape a fork along the walls to remove the spaghetti shaped squash and place in your largest pasta dish or platter. Serve your veggies and sauce over your spaghetti squash for a wonderful meal for the whole family. Don’t forget the bread to sop up all those delicious juices and flavors. Whisk cream into light pillows. Stir in: lemon juice, mustard, sugar, fresh mint and salt and pepper. Add: equal parts of kohlrabi and apple. In a bowl, stir together pepper, strawberries, onion, cilantro, lime juice, salt and sugar. Set aside. Stack tortilla and cut in half. Cut stacks crosswise into 1/4 inch strips and in heavy skillet heat 1/2 inch oil over moderate heat until hot but not smoking. Working in three batches, fry tortilla strips until crisp and golden, about 30 seconds and with a slotted spoon transfer to paper towels to drain. Sprinkle fried tortilla strips with salt to taste. Halve avocados, removing pits, and peel. Slice each half length-wise into 6 wedges and fan onto 4 salad plates. Spoon about 1/3 Cup salsa over avocados and mound crispy tortillas strips along the side. Preheat oven to 350°F. Arrange pancetta or bacon in single layer on rimmed baking sheet. Cook until just crisp, about 15 minutes. Transfer to paper towels to drain. Reduce oven temperature to 200°F. 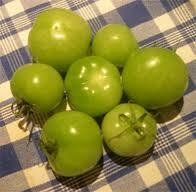 Sprinkle all green tomato slices with salt and pepper. Place 1/2 cup flour in shallow bowl. Mix remaining 1/2 cup flour with cornmeal in another shallow bowl to blend. Working with 1 green tomato slice at a time, coat with flour, then egg, then flour-cornmeal mixture. Transfer to first baking sheet. Line second baking sheet with paper towels. Heat oil in heavy large skillet over medium-high heat. Working in batches, fry green tomatoes until golden brown, about 2 minutes per side. Using slotted spoon, transfer to second prepared baking sheet; sprinkle with salt and pepper. Keep warm in oven. When ready assemble sandwiches using warm toast spread with herb flavored mayo and add a layer of fried green tomatoes and pancetta or bacon, cover with another layer of toast and get ready to serve and enjoy. *Pancetta, Italian bacon cured in salt, is available at Italian markets and some specialty food stores and supermarkets. Cook beans, covered in a large pot of lightly salted boiling water over high heat until crisp tender. Quickly rinse beans in cold water (to enhance the deep green color) drain beans well. Place dill garlic, salt and pepper in a large glass bowl and add beans to this dill mixture. Add olive oil and toss well. Add tomato and onion, and toss gently. Cover and refrigerate up to 24 hrs. Remove beans from refrigerator and let stand, covered at room temperature 1 hour. Add 2 TBL lemon juice and toss gently. Taste for seasoning and add remaining lemon juice, if desired. Cook the green beans in a pot of well-salted boiling water for about a minute or two, just long enough that they lose their raw edge. Drain and dunk in ice-cold water to stop the cooking. Drain again and set aside. Heat your largest skillet over medium heat. When the pan is hot, add the oil, garlic, onion, and bay leaves. Cook for 5 minutes, or until the onions and garlic start to brown just a bit. Add the wine and cook until it has mostly evaporated. Carefully remove the bay leaves. Stir in the paprika, cumin, coriander, curry powder, salt, crushed red pepper flakes. Stir in the tofu and raisins and cook until heated through, a minute or so. Add the butter and green beans and stir until the butter has melted. Remove from heat and stir in the crème fraiche, then most of the almonds and most of the cilantro. Taste and add more salt and some pepper if you like. Serve topped with any remaining almonds and cilantro.